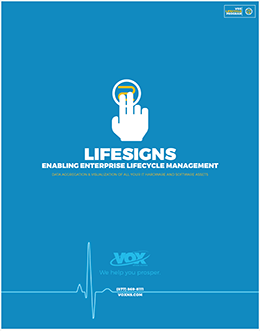 VOX Lifesigns is a powerful, cloud-based tool that evolves traditional asset management into an entirely new stratosphere, driving new layers of visibility, productivity, flexibility and transformation. Lifesigns leverages the power of big data, data mining, machine learning and advanced analytics to deliver the industry’s leading application for enterprise lifecycle management. Through our modern UI, you now have insight into every single asset that is part of your IT infrastructure! Every piece of hardware, every deployed software, and every maintenance agreement.